1. Trim 1/4 inch off the closed end, and cut the case in half on the diagonal. Turn the fabric of each of the four diagonal cut edges over by 1/4 inch, twice; pin, and hem. 2. Place one pillowcase half inside the other, lining up bottom edges; pin, and sew at front where fabrics overlap. Repeat on other side. Turn fabric inside out, and hem case's cut bottom. Trim with pinking shears. 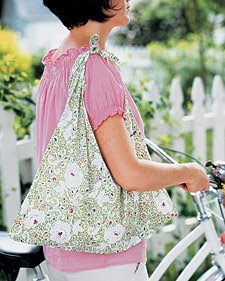 Turn case right side out, tie top ends into a knot, and you have a carefree summer bag.